He’d been exhausted last night and needed a full night’s sleep. It was still dark outside as he slid out of bed and slipped on his running gear. His morning run helped him keep his thoughts straight and make a reasonable start to the day. He grabbed the bottle from the shelf beside the door, and it swung wide as he headed outside. If he didn’t run he’d go insane or at least more insane than he felt already, dealing with the unrelenting pressure of being senior detective. As he headed down the steps he heard the satisfying clunk of the door closing. I read a good book recently, y'all. Let me tell you a little about it. Gypsy Hunted is a psychic mystery suspense/thriller, book one in the Gypsy Shields series. The action in the book is told from multiple points of view, including that of Gypsy's hunter. The reader knows his/her identity, so the case is only a whodunit for the police. (There is also a secondary mystery, a true whodunit, involving the confidential police reports taken by the first victim.) Gypsy's POV is told in first person; the others' in third person. Here are just of few of the reasons I enjoyed reading Gypsy Hunted. I like Gypsy herself, because she is such a strong character, with very strong willpower. By sheer determination and much practice, she recovers her speech ability and fine motor skills much sooner than the doctors had expected, within days of the accident, instead of it taking weeks as usual. Other favorite characters are Connor, blind date / detective in charge of the case, and Gypsy's niece Renee, a precocious 13-year-old who shares a psychic connection with her aunt. This connection proves to be crucial to the case. I like how the relationship between Gypsy and her younger sister Leah changes during the novel. In the opening scene, as she is walking to the restaurant to meet her blind date, Gypsy reflects on the irony that one of her most favorite people in the world, her niece Renee, is the daughter of one of her least favorite people, Leah. As young children, the sisters were close - until Gypsy's puberty began. This closeness was torn asunder by Gypsy's hormonal bombardment, parental favoritism, hurt feelings, and misunderstandings by both sisters. An unexpected and quite positive result of Gypsy's accident is their reconciliation, following their first real heart-to-heart talk in many years. I enjoyed reading Gypsy Hunted by Andrea Drew. I look forward to reading more about Gypsy - and, hopefully, Connor, Leah, and Renee - in Gypsy Cradle and Gypsy Curse (see the interview for more information). and Goddess Fish Promotions Book Tours in exchange for an honest opinion of the book. I have a special guest in the studio today. Please help me welcome Andrea Drew! This book actually started as a short story. A writing friend and I would get together every couple of weeks for some time away from our young children to talk about book ideas. We started with short story ideas with a view to entering competitions. I found one comp with a theme of time. I threw a few ideas around and discussed the idea of a telepath or psychic, throwing that into the mix. I was very excited and enthusiastic about the story. Once I started writing the short story, I found I didn’t want to stop, and I didn’t. I ended up writing 62,000 words and Gypsy Hunted was born. One of my favourite characters is actually a villain. He is so screwed up and tortured, and so genuinely bad (causing a fair amount of damage and destruction in other people’s lives) that I loved him. It was so much fun writing an evil character. I’ve discovered it’s great fun to be evil (at least when writing anyway). He is a villain, but has some traits that I believe a reader can understand although he definitely is not an anti-hero. There is another super gorgeous character in Gypsy Hunted who is my ideal man, and so of course he is featured in my next series. Writing when it is just flowing and there is a huge adrenaline rush and release. Of course being an author isn’t always like that. The creation of characters, worlds and stories is great fun, and is in my opinion the best part of being an author; the imagination is given free rein. I can now do something constructive and positive with my natural tendency to create stories based around people and circumstances I observed in everyday life. Plus of course is someone pisses me off in real life, I can simply kill them off in my next book, very satisfying. I began as a young child purely for the love of it. I announced around 9 that I would be a writer when I grew up, and was persuaded out of that profession (wouldn’t want me to starve) and into secretarial and administrative work. I picked up writing commercial in 1998 and started a business but didn’t begin writing novels until 2013. I’ve never looked back. Amazing though how life and fear can hold a writer back, in my case for nearly 30 years! At the moment I’ve written one book Gypsy Hunted and am currently working on the next one Gypsy Cradle. I’m writing them in a way that each book builds on the next but also as a series. I have three of them planned and outlined and am writing the second now. I do prefer to write series though, primarily because I’ve found I become very attached to the characters and don’t want to let them go. I now have an idea for the next series, which will probably be romantic suspense rather than a straight suspense thriller, and it will be interrelated, with a character in Gypsy Hunted given a series of their own. Yes I have written an outline for the next in the series Gypsy Cradle and have written the first few thousand words. Gypsy Cradle is great fun, it is best described as “Fatal Attraction” meets “The Sixth Sense” from there I have Gypsy Curse planned out, which involves of course more psychic and telepathic powers to solve a murder, but this time involving a child abduction ring. As you can imagine emotions run high, as do the stakes which are pushed to the nth degree. From there, I have started planning out the first in the next series which I’m very excited about. It will feature a hunky character from Gypsy Hunted and is tentatively titled “the Sentinels Kiss” I’m excited about this series and I hope readers will be too, my first romantic suspense book. Stephen King Mr. Mercedes as well as On Writing, Michael Connelly, The Catcher in the Rye by J D Salinger and the Lovely Bones by Alice Seobold. All of these books influenced my life in that I discovered that some books can not only entertain but move the reader so deeply that they don’t forget the story. I certainly haven’t forgotten those authors. I’m really not sure if I’m up to a point as an author where the reader is deeply moved by my stories, they are written as pure entertainment (the books I wanted to read) although one of my reviewers recommended readers have a box of Kleenex nearby. It’s all subjective in this business. I might be getting there though. Definitely Stephen King and probably also S J Watson, author of the debut best seller before I go to sleep. Stephen King because he has stood the test of time, and I love his no nonsense, no BS approach. I’ve lost count of how many times I’ve read his book On Writing. S J Watson because I’d love to hear about how he did it and what the journey has been like from obscurity to becoming best seller. It’s something I like many authors dream of and I’d love to know if there are any secrets he would be willing to give away. Plus I’d love to have one or both of those authors critique my work. Currently I have a couple on the go. The Red Cardigan which was recommended to me by a friend on Goodreads and the other is Bones are Forever by Kathy Reichs which is my 2nd time reading it, I really love that book! I naturally gravitate toward suspense thrillers so it seemed like a no brainer that when I wrote a book it would be in the same genre. Other than reading and writing can I count sleep as a hobby? Probably not. I have three children so outings with them are fun and are literally a breath of fresh air. I’m also rediscovering my love of the gym. Yes Rachel Abbott although she isn’t really a new author (her first book was published in 2011) and the same with S J Watson. Both of these authors write psychological thrillers which I find fascinating. Plus they are both best sellers so they must be doing a whole lot right. I’m definitely nowhere near their league, but I am constantly on the lookout for ways to improve my writing, and the marketing of my works so I’m confident I will only get better with time. Rachel Abbott – currently alive and one of the few bestselling (top 100) independent authors I know of. She seems like a lovely person, plus I’d definitely pick her brains on how she did it. S J Watson – He had his debut novel a psychological thriller made into a movie starring Nicole Kidman and Colin Firth. I like most authors’ dream of achieving the same, so I’d love to talk to him about it. Bread and milk I have to have or my children would revolt. The other is butter, real butter not a mix of butter and other oils to make it softer, the real stuff. Plus I am pretty sure there are usually sausages in there, my children’s favourite. I wish there was more chocolate in there, but it lasts for literally seconds before it is pilfered so I have to hide that sort of stuff. 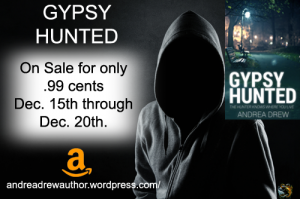 Gypsy Hunted will be on sale as part of a kindle countdown deal for 0.99 from 15th to 20th December 2014. Well, that's all the time we have for today's interview. Thank you so much, Andrea, for visiting the Jane Reads studio, and thank you to our great studio audience! I hope you enjoyed the interview as much as I did. 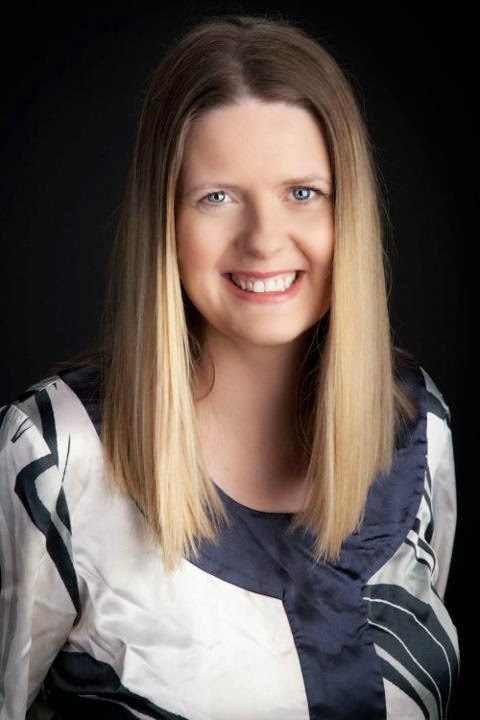 Andrea Drew has been a commercial copy writer and résumé writer for over a decade. Her self-published book "Pro Résumés Made Easy" has been downloaded over 40,000 times. Andrea has one husband (more than enough), three kids, a pet rock (her daughters not hers), and a house in the suburbs, where she's hard at work on the second novel in the Gypsy series. 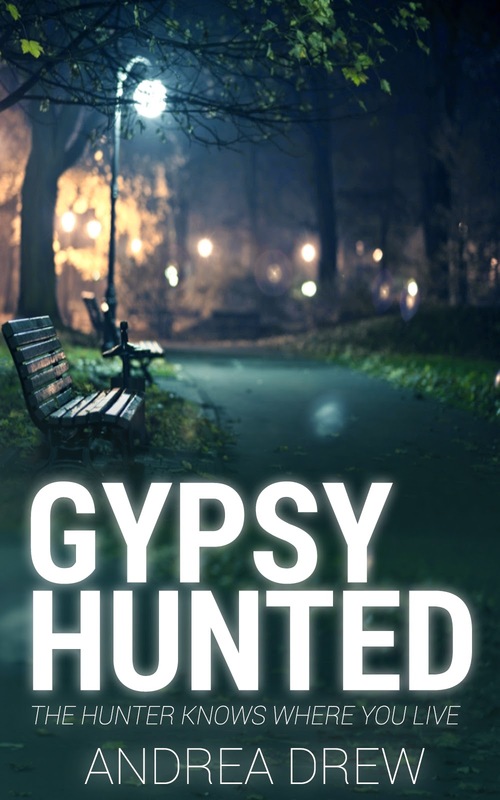 Gypsy Hunted her first fiction novel (her first suspense thriller set in her home town of Melbourne Australia) is available for pre-order on Amazon prior to release on October 28 2014.